The 2015 tournament kicked off at 10-20 am on Sunday 1 March. 32 schools from around England and Wales ready to provide a large crowd with some excellent rugby. HCS started against Sir Thomas Rich's in group A, we scored from the kick off, the ball bouncing kindly straight into the arms of Jack Helme, who avoided a tackle and scored under the posts, another quick score from Olly Gaston put us 10-0 up at half time. Tom Porter and Luke Clarke added tries and with a couple of conversions from Will Butler, we won 24-12. The second game was against Shrewsbury, the home crowd had grown in number and we did not disappoint. Helme scored early and tries from Ellis Ward, Tom Scotcher and Gaston put us 22-7 up at half time. Shrewsbury hit back with a well worked try but more scores from Sam Prestwich and Ward sealed an excellent performance 32-14. 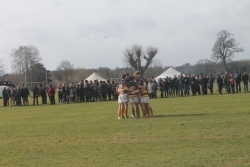 The final group game was RGS Worcester, James Girling and Prestwich scored in the first half but RGS hit back scoring two quick tries, half time 12-12. The second half was a tough encounter, but we managed to score through Cam Hunter and then Ward struck twice to register a 24-12 victory. We had won the group and progressed into the cup knockout stages, a quarter final against Worth. The start of the match was greeted by some severe wind and rain but we struck early through Butler and he soon added another try to go ten points up, Worth powered their way back into the game and levelled the score by half time. They also ran in a try straight after the break and we were suddenly 14 -10 down. We worked hard and had two glorious opportunities to score but a slight lack of precision let us down, Worth intercepted our last play and ended up scoring to end the Marches dream, final score 19-10. We also had a B squad in the tournament and they performed remarkably well throughout the day, their first game was a defeat to Barnard Castle but they re-grouped and had a victory against Bro Morgannwg 28-5, Ali Milne and Shaun Meredith both scoring two tries each. We lost our last group to Glantaff but qualified for the Bowl, a quarter final game against Malvern, the boys worked extremely hard but eventually lost 26-12. Steffan Growcott going over twice in the second half.